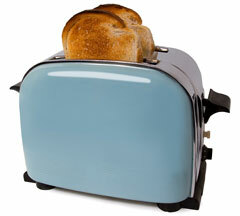 Toasters are one of the most popular and common small appliances. They are used primarily to toast bread, but models are available to toast english muffins, sliced bagels, and toaster pastries. Toasters are available in professional, designer, or basic models with regular or wide slots. Toaster ovens are used to toast bread and also to bake or heat small food items. Automatic bread machines have added a whole new dimension to bread making. For those who are not bakers, bread machines make it easy to make homemade bread. You simply put the ingredients into the bread pan, set the controls, and voila — in a few hours, your fresh baked bread is ready to eat! 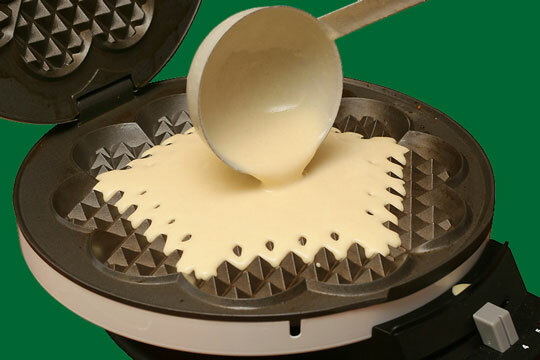 A waffle iron is used to make waffles. Batter is poured onto the lower part of the heated iron, the iron is closed, and the waffle bakes until it registers done. Usually there is a light which indicates that the waffle has finished baking. Waffle irons come in a variety of shapes and sizes; a Belgian waffle iron makes thicker waffles than a standard waffle iron. Electric grills enable you to grill food indoors. They are styled as either one-sided open grills or two-sided contact grills. The latter have grill surfaces on their hinged lids, so that you can grill both sides of a food item simultaneously. Some grills, designed with interchangeable plates, can also be used as griddles or sandwich presses. A slow cooker is used to cook stews, soups, and other dishes for long periods of time at fairly low temperatures. 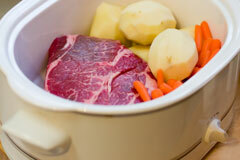 Ingredients are often added to the pot and left to cook unattended, perhaps for several hours. Countertop ovens are small ovens which sit on a kitchen countertop and have multiple cooking functions such as bake, broil, and roast. Some of them may also have a rotisserie. Ovens are available with convection features as well. Countertop ovens can be used alone, or as a supplemental oven along with your range oven, when a large amount of food needs to be prepared. Deep fryers are used to deep-fry foods such as french fries, chicken, and donuts. The food is placed in a basket and usually fried in some type of vegetable oil. Large electric turkey fryers are also available. Popcorn popping machines use either hot air or popping oil to pop the corn. Generally, the hot air popped corn is lower in calories because oil is not used. These poppers produce popcorn at lower cost than microwave-bag popping corn. Coffee makers are available in many different models to brew coffee, espresso, and other coffee beverages such as cappuccino and lattes. 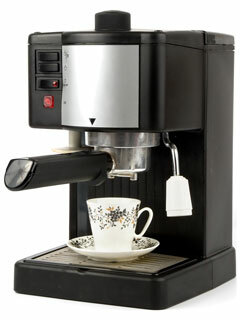 The coffee makers may be designed as drip models, percolators, or espresso machines. Appropriate receptacles in the machines are filled with coffee and water, and various controls are used to operate the machines. Coffee grinders are used to grind coffee beans. The grinder is set for the type of grind desired — fine, regular, coarse, or anywhere in between. Coffee grinders are designed as either blade type or burr type grinders. Some coffee machines will also grind your coffee just before brewing it. Electric kettles are used to heat water or other liquids for tea, cocoa, or other instant mixes. They may be either corded or cordless, and there are a number of styles and sizes on the market. Drink mixers are used to mix all kinds of shakes, smoothies, and other cold drinks. They may be the "soda fountain" style mixers or newer smoothie machines that crush ice and dispense the drink through a spigot. Food processors enable you to prepare chopped, sliced, or shredded food by means of various types of blades. Grinding and pureeing are easily accomplished with these versatile appliances. They can save a lot of food preparation time, and may also be used to prepare dough or even to whip egg whites. Full and mini size versions are available. Juicers are used to produce juice from raw fruits and vegetables. Several juicing methods are used. Centrifugal juicers and centrifugal ejection juicers work well for juicing most vegetables and fruits. Manual press juicers squeeze the juice from soft produce, whereas augur juicers crush the produce into the walls or screen of the juicer. 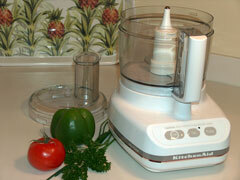 Augur juicers work well for leafy greens and certain other vegetables. Twin gear press juicers shred and squeeze the produce; they are best for juicing vegetables. Blenders are used to chop, blend, and puree foods. The better models will also do a good job of crushing ice and are used to prepare smoothie type drinks. Blenders are also available to grind grains. Hand, or immersion, blenders are handy in the kitchen. They are used right in the pot or glass, eliminating the need to ladle food into another processor. Mixers are available either as handheld or stand units. The handheld mixers are handy for small jobs such as beating eggs, cake mixes, and small amounts of food. 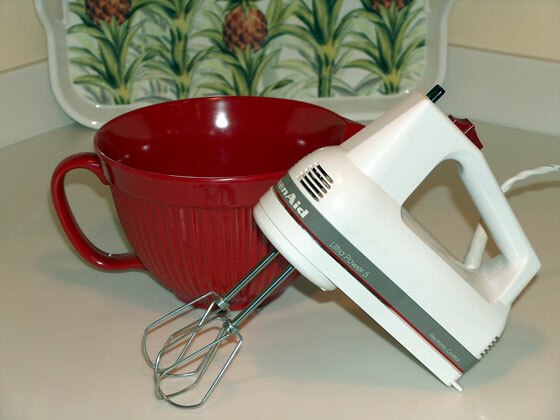 Heavy-duty stand mixers can be used for mixing anything from delicate pastries to large amounts of bread dough. Stand mixer manufacturers usually offer an array of optional accessories for grinding and processing foods, making pasta, and juicing fruits. Ice cream maker appliances are of three basic types. Some turn a dasher in a can of prepared ingredients inserted in a bucket of ice and rock salt; others utilize pre-frozen canisters into which the ice cream mix is poured and frozen while turning a paddle. The most expensive ice cream makers feature self-contained freezers. All of these ice cream freezers make it relatively easy to make all types of ice cream as well as sherbets, sorbets, and ices. Electric can openers are designed to be mounted under a wall cabinet or to sit on a countertop. How does an electric can opener work? Its sharp blade bites into the top of a can and the can opener mechanism grabs the top edge of the can. A gear slowly rotates the blade around the can, severing the top of the can from its side walls.